Today people spend a quarter of their waking hours on mobile screens, yet capturing people’s attention -- today’s most scarce resource -- has never been harder. With that in mind the 2019 Mobile Ad Creative Index reveals how ad creative impacts user engagement in deep-funnel events and arms marketers to effectively win high-value customers on mobile in 2019. Master the art of mobile ad creative. The average person is exposed to 5,000 ads a day, online and off. To be relevant, marketers need data and technology to gauge people’s context, and human creativity to craft the message that resonates. 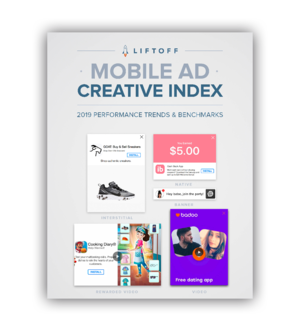 The data in this first ever report from Liftoff highlighting ad costs and engagement by ad creative format will help you benchmark your mobile ad creative performance and plan your strategy in 2019. 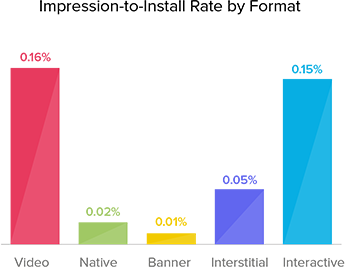 Want to learn more strategies for effective mobile ad creative? Watch our on-demand webinar "Mobile Ad Creative: Tips & Tricks from App Marketing Experts" where app marketers from Bumble and Skillz share their best practices for designing ad creative that converts.